I’m happy to say I have a new book out–Gypsy Wisdom: New & Selected Poems (Park Place Publications)—and I thought I’d first let people know about it on my Facebook page, but, carried away with enthusiasm (it seems), I ended up posting a sort of mini essay in four parts, “Making a Book,” which might have been more appropriate for this blog, so … here’s that piece on Bill’s Blog. 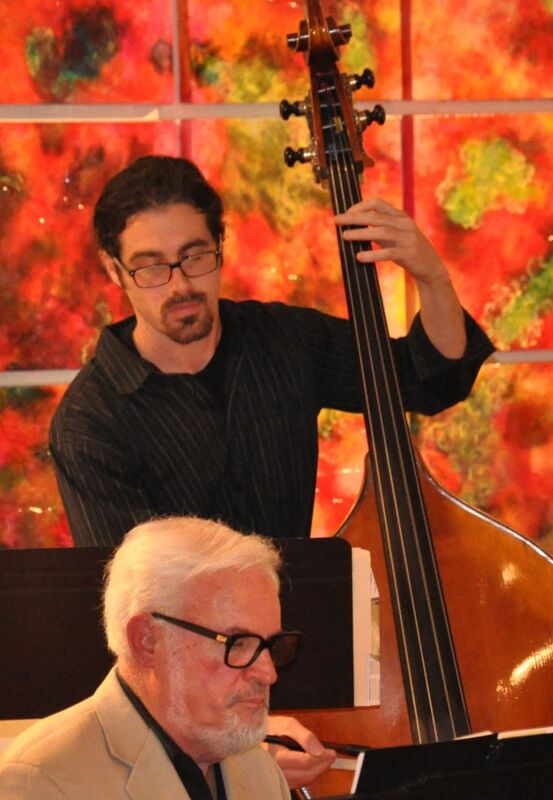 I’ll take this “Upcoming Events” post a step further, because we are having a Book Launch concert at the Museum of Monterey Stanton Center Theater in Monterey on Saturday, July 25 (7:30 PM), featuring vocalist Jaqui Hope, bassist Heath Proskin, and yours truly on piano and reading the poems—and we hope to get Gypsy Wisdom: New & Selected Poems off to a good start that way. 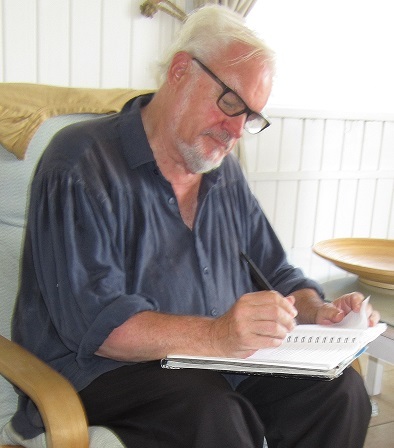 If folks hear the work—especially if sung (and I have set several of the poems to original music)—and like what they hear (I’ve had people tell me the music adds a rich and enjoyable dimension to the poems), they tend to want to make a purchase and take the book home with them, which is fine with me! Here is the initial design I created for the cover of Gypsy Wisdom: New & Selected Poems (a design which included my own art work: an ink painting called “Goat Pan & Tree,” a woodcut print based on Ovid’s “Halcyon & Ceyx,” and an oil painting I did at Coney Island while an art student at Pratt Institute in 1955)—and alongside that, the cover Patricia Hamilton (Park Place Publications) and I finally decided on. 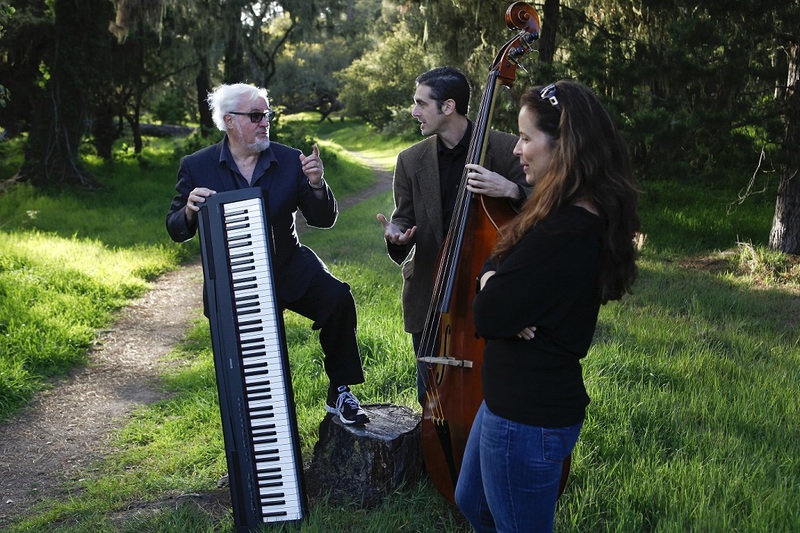 And I’ll re-tell the four part story of how this project unfolded, right up to the point we’re at now: getting set for next Saturday’s Book Launch performance at the Museum of Monterey. Having a hand in shaping the look and feel of a book is nearly as engaging (exciting!) as providing the content or text itself, but next, I found myself at the most brutal stage of all: final proofreading—that “fun” stage when typos seem to pop up like gremlins, just to sport with the unappealable “product” like flies. Once again, many thanks to Patricia for her technical savvy, good taste, unerring eye, empathy, and consistently cheerful disposition (she’s a joy to work with)! I looked forward to the best stage of the game: actually holding a printed copy of Gypsy Wisdom: New & Selected Poems in my hands! Making a book: Part Two. The book—Gypsy Wisdom: New & Selected Poems—has been made (after a thorough proofreading of the text, several times—in spite of an ongoing “eyesight” situation: flickering, fluttering vision that makes the world I witness resemble a pulsating, Chaplin or Buster Keaton silent movie on occasion; see the past post “This Mild Yoke: A Writer’s Eyesight”) and copies are being printed as we speak. Hallelujah! And I have arranged a Book Launch event at the Stanton Center Theater in the Museum of Monterey on Saturday evening (7:30), July 25—an event that will have plenty of copies of the book on hand (for sale) and feature the “team” or troupe I’ve worked with “in concert” before, in performances that also combined spoken word and music: vocalist Jaqui Hope and bassist Heath Proskin. Jaqui, Heath, and I gave a performance of some poems from the book I’d set to original music at the Cherry Center for the Arts in Carmel in mid-March, and that went very well. The Museum of Monterey event on July 25 will expand and enhance that presentation to include new work from Gypsy Wisdom. I’ll have more to say about another upcoming event (another reading I have been asked to give at Old Capitol Books in downtown Monterey on September 13, with poet Maggie Paul from Santa Cruz)—and I’ll post a couple of the poems from the book, and access to some pieces that can be found on YouTube. Making a Book: Part Three. For the geographically-challenged who may not be able to make the Saturday July 25 Book Launch Concert, Gypsy Wisdom: New & Selected Poems is now available at (and I apologize for the horrendously long URL, but I can’t recall, at the moment, just how to access the book directly by way of the cover and a mouse!) 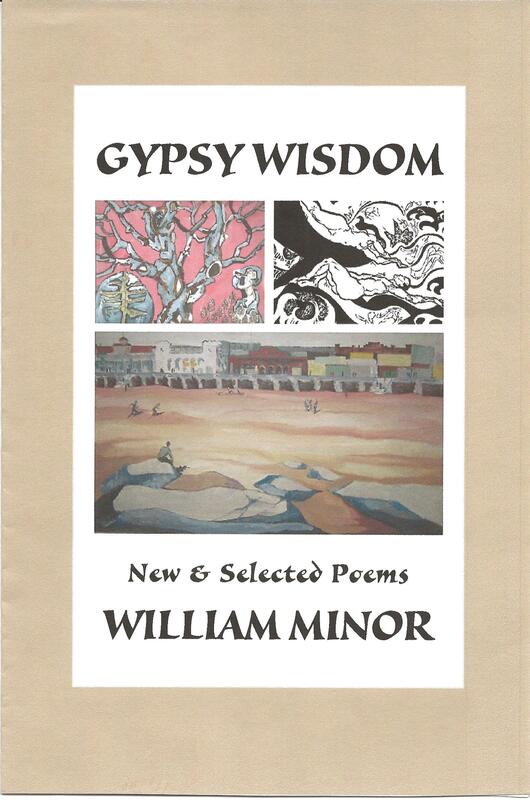 http://www.amazon.com/Gypsy-Wisdom-New-Selected-Poems/dp/1935530976/ref=sr_1_1?s=books&ie=UTF8&qid=1437084889&sr=1-1&keywords=gypsy+wisdom+new+%26+selected+poems+by+william+minor. 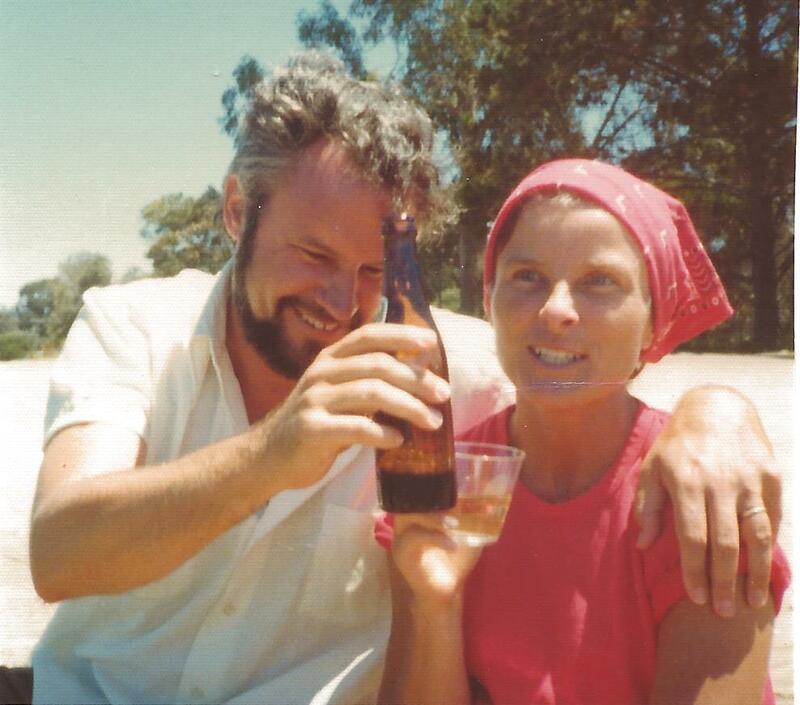 And because I promised to post a poem or two from the book, and because this day is TBT (Throw Back Thursday) on Facebook, I’ll also include some photos that resonate with “For Betty,” a poem that’s not been in print (outside the book) until now. 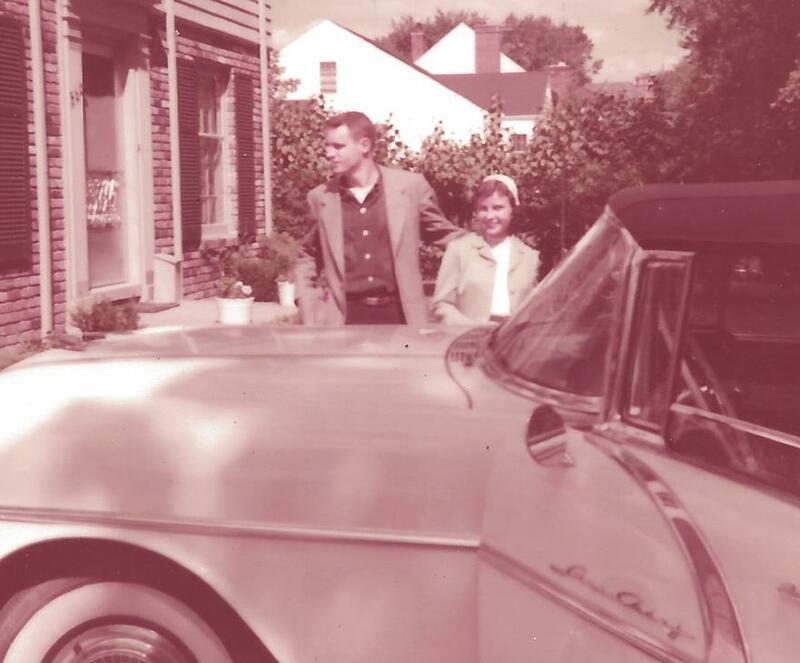 Here are: 1956: my wife Betty and I, although not yet married, approaching my father’s Pontiac convertible–in which we “courted,” and which would deliver me to Willow Run Airport in Michigan, for a prop plane flight to Hawaii (crossing “The Point of No Return”), where Betty would join me four months later and we would get “hitched”; Betty with our kids, Steve and Tim, the latter proudly displaying one of Daddy’s woodcut prints when we lived next door to St. Ignatius Church on a small strip of McAllister Street in San Francisco; Betty and I in “full dress” (I had to rent the tux and cummerbund) before a Robbie Burns’ dinner when we came to Monterey, at which (having rehearsed for months for the sake of authenticity), I played piano and sang songs by the Bard (an authentic Scot sitting near Betty leaned over to someone and asked, “Who’s the Yank with the phony accent?”); and the two of us at a picnic in Monterey, toasting many faraway friends we missed at the time (and still do! 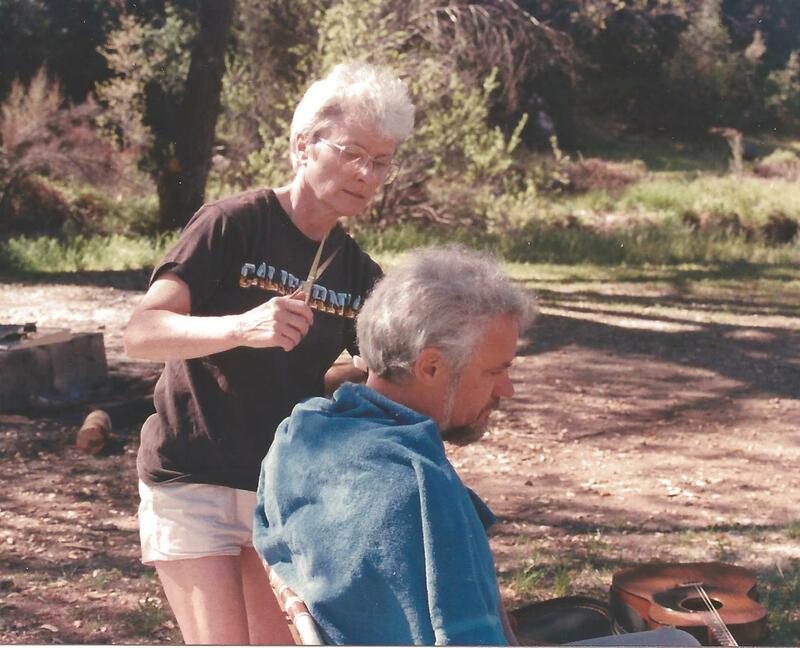 ); a shot of my “barber,” the person who’s cut my hear for 58 years (Betty! 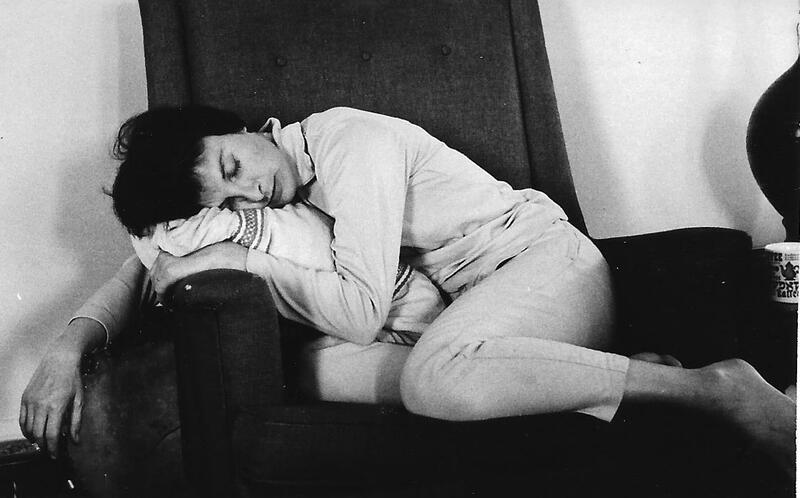 ); and a photo of Betty getting some well-earned rest. to keep us on (or off) our toes. I like/ the dance of grace and favor we’ve/ been given, and the ongoing story/ of what’s to come. Again: grand “tech guy” that I am, I couldn’t find a way to set the poem up as it should be (with the original line breaks and stanzas). I’m disappointed, but I’ll have to confess, it does save space to present a poem this way! 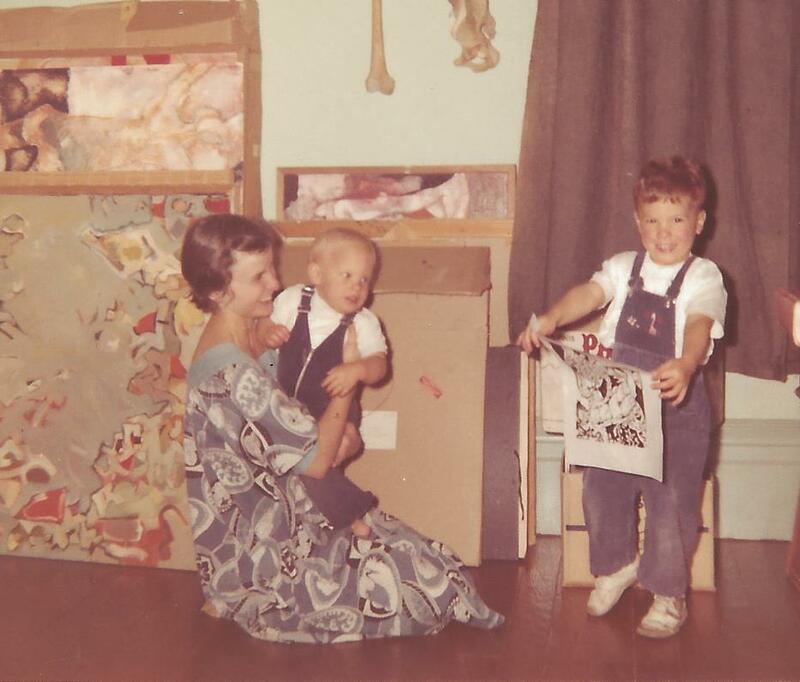 Making a book: Part Four. Now the fun starts—distribution and getting set for the Book Launch event for Gypsy Wisdom: New & Selected Poems at the Museum of Monterey on Saturday, July 25. I still enjoy addressing envelopes by hand, and I mailed 65 flyers to folks I hope will attend our event, along with the invitations sent out on Facebook. I’ve also taken copies of Gypsy Wisdom to two local bookstores: Old Capitol Books in Monterey and BookWorks in Pacific Grove. 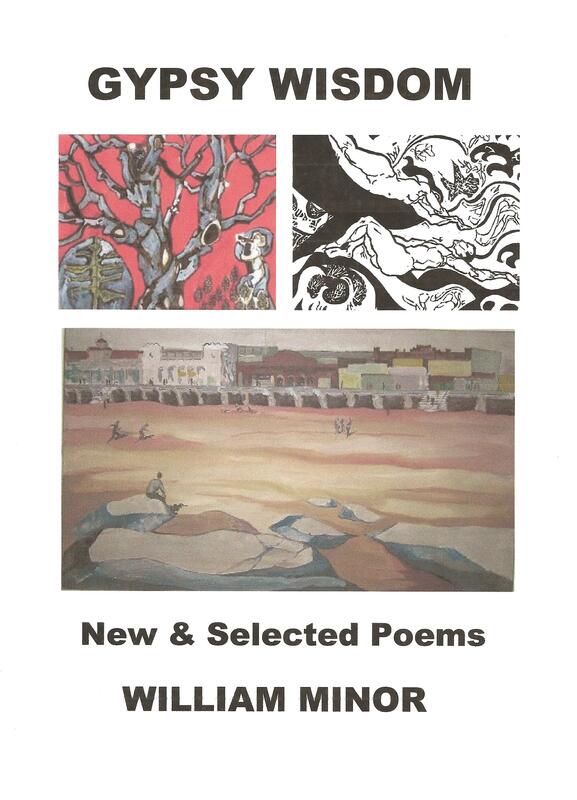 The book is available at amazon.com (and we’ve even made the first sales there); and notice of the July 25 event has been posted on the Poetry Santa Cruz site (thanks Len Anderson!) and in Cedar Street Times in Pacific Grove (thanks Marge Ann Jameson!). 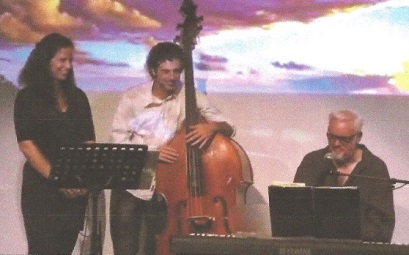 Bassist Heath Proskin, vocalist Jaqui Hope and I (piano) had a fine rehearsal last night, and we’re set to go for the July 25 “show” (offering the poems from Gypsy Wisdom I have set to original music–and I’ll read others). 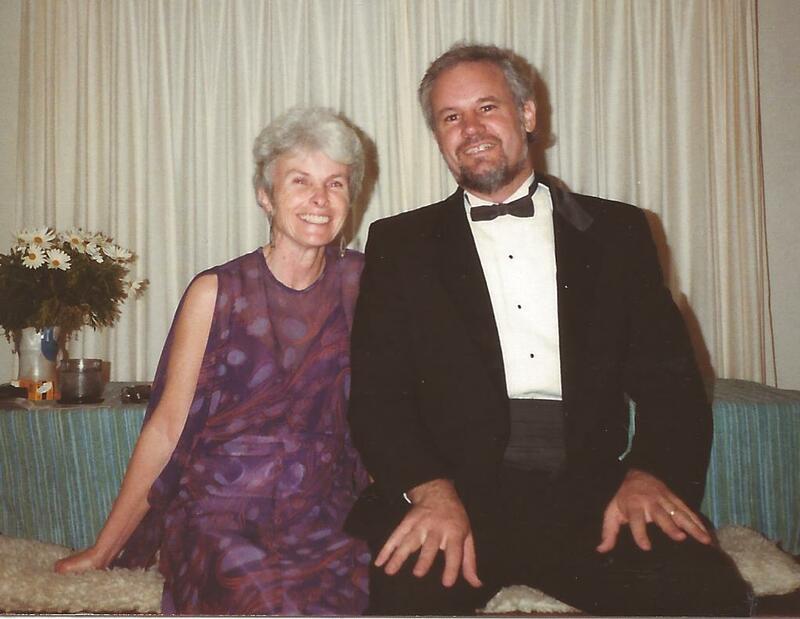 I’d like to re-post a YouTube video of Jaqui singing one of those poem/songs, “My Fingers Refuse to Sleep” (https://www.youtube.com/watch?v=RLqjmDeiz2s ), along with our troupe doing “It’s a Wonderful World” (our “signature” song—just to give you further evidence of our musical flavor: https://www.youtube.com/watch?v=xLHVwizEvNA&feature=youtu.be); and a YouTube video, “Mandelstam and Minor” (https://www.youtube.com/watch?v=HxliLhcnyAY ), produced by my friend Bob Danziger, who liked a translation I did of a poem—“No, Never Was I Anyone’s Contemporary”—by the Russian poet Osip Mandelstam (also included in Gypsy Wisdom) and asked if I’d record it as a video (and include my own art work and that of Mandelstam’s era). And Heath Proskin and I doing another poem from the book, “Sandra Bullock,” can be found at: http://eat- magazine.bandcamp.com/track/sandra-bullock. 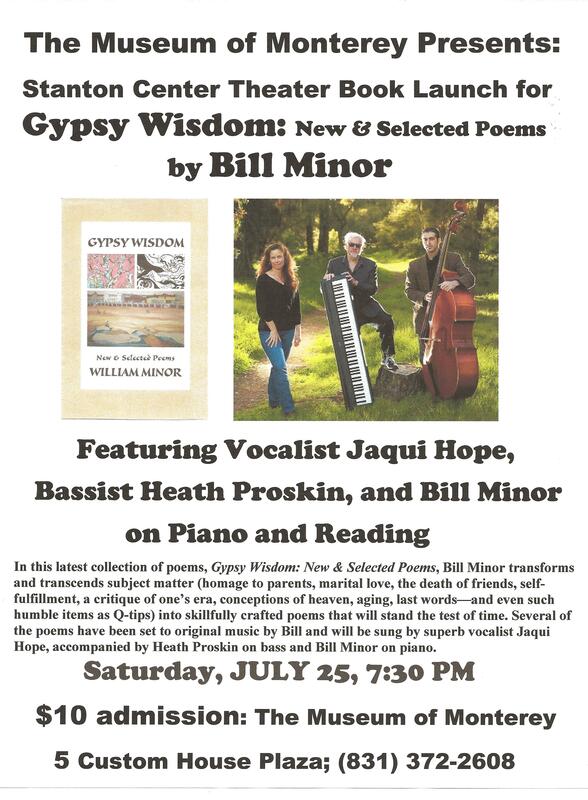 That’s a sampling of what we’ll be doing on the evening of July 25—and I’ll be sure to have ample copies of Gypsy Wisdom: New & Selected Poems on hand (for sale). If you’re close by, remember: Museum of Monterey Stanton Center Theater (5 Custom House Plaza, next to the wharf in Monterey: (831) 372-2608). If you’re not close by and unable to attend this event (this blog has reached people in 35 different nations around the world! )–I’ll be playing piano and reading the poems just for YOU!